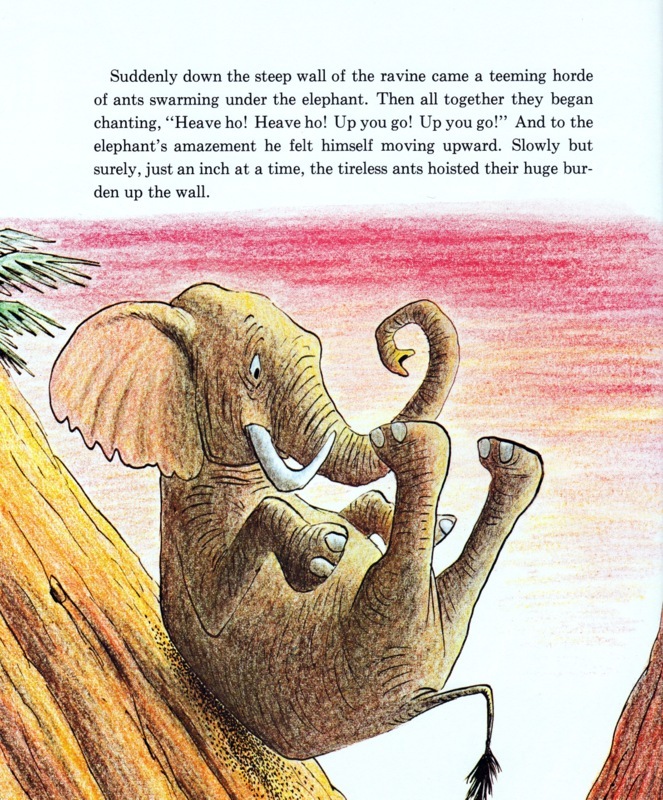 The Ant and the Elephant by Bill Peet: There’s strength in numbers. 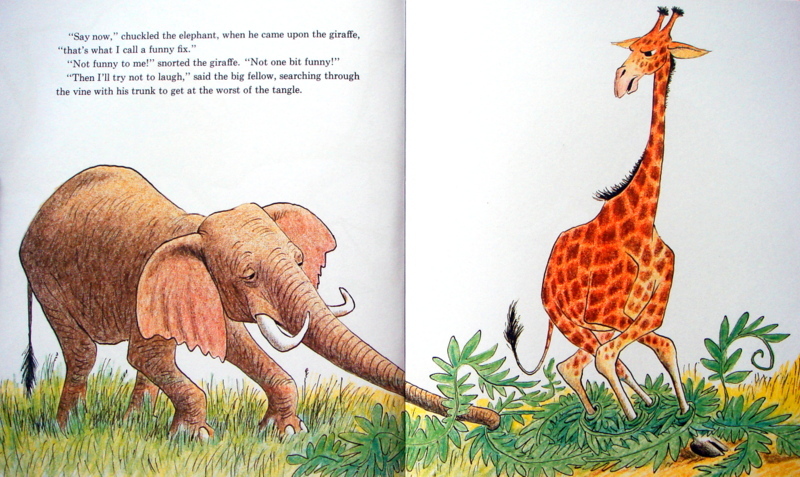 Bill Peet (1915 – 2002) wrote and illustrated 36 books (most of which remain in print) and I truly love them all. His books are sublime. Full of humor, compassion, and warmth, his stories often focus on friendship, kindness and respect for the environment. Yet Peet was never condescending or didactic, he held his audience in high esteem. That his lengthy, complex books still hold the attention of today’s easily distracted children is a testament to his connection to young minds. Peet’s lavish, enchanting art was created with colored pencils, pastels and India ink. 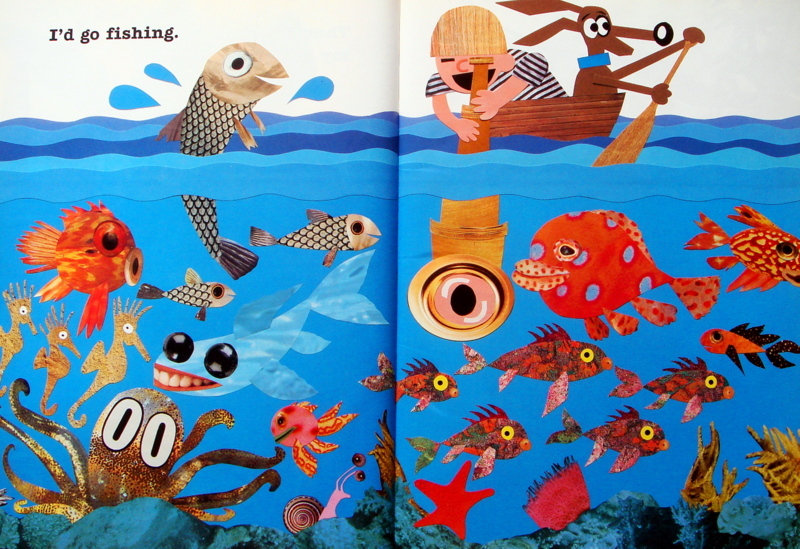 His illustrations are colorful, detailed, expressive and whimsical. His wholly satisfying books are fantastical journeys into strange yet familiar lands featuring lovable, sympathetic characters (usually animals). 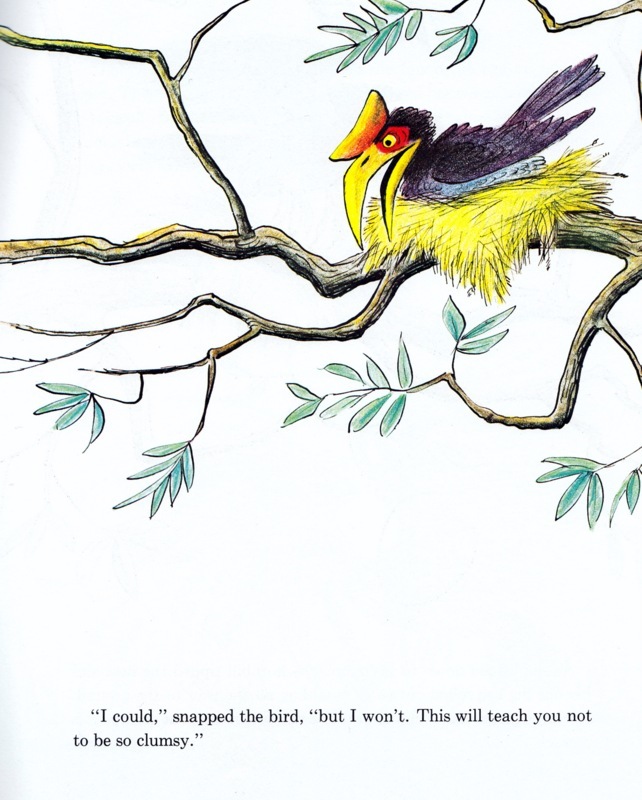 Prior to publishing his first book, Hubert’s Hair-Raising Adventure (1959), Peet worked for Disney Studios (he was there from 1937 to 1964). He worked on several of Disney’s most famous films, including Pinocchio, Fantasia, Dumbo, Cinderella, Sleeping Beauty and Jungle Book (though his work on that film went uncredited due to a dispute with Walt Disney). Peet also created the first Disney film to come from a single storywriter, 101 Dalmatians—based on the book by Dodie Smith. He wrote the script, created the storyboards and designed the characters. 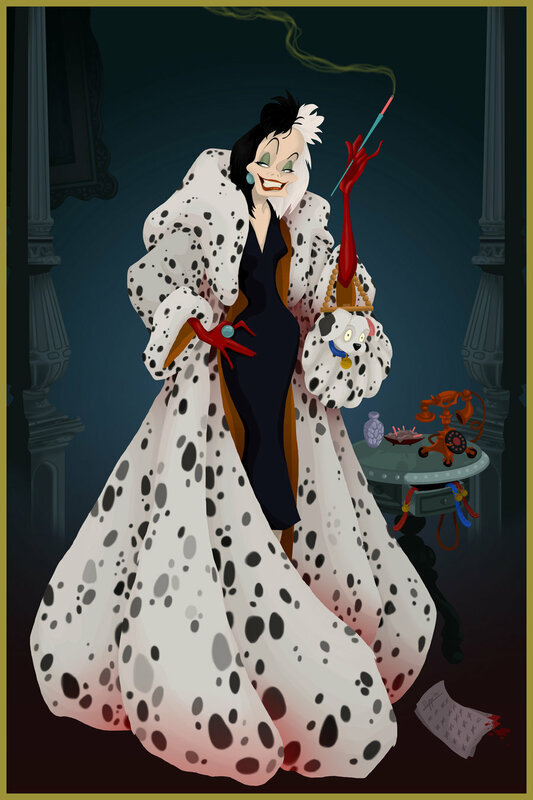 It was Bill Peet who created the iconic Disney villain that so many people (myself included) love to hate, Cruella de Vil. Isn’t she just perfectly evil? Because of Peet’s work with Disney there’s a familiarity to his art; once readers begin to recognize his style, it becomes easy to spot his creations in the films he worked on. 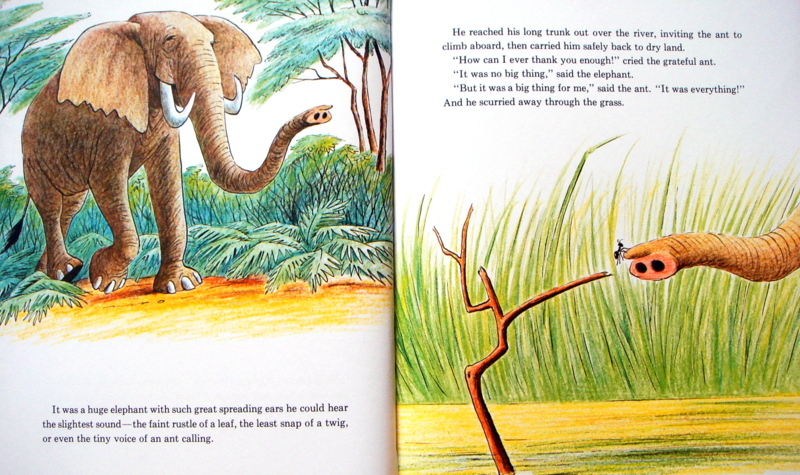 The Ant and The Elephant is a twist on Aesop’s The Lion and the Mouse, in which a meek, small character is remarkably able to help a large, strong character. While climbing a long blade of grass for a better view of the river, a small ant finds himself in a predicament after being blown by the wind. The minute creature lands on a stick in the middle of the river. He would surely drown if he tried to get to the shore himself, so he asks a nearby turtle for assistance; the grumpy turtle cannot be bothered to help. 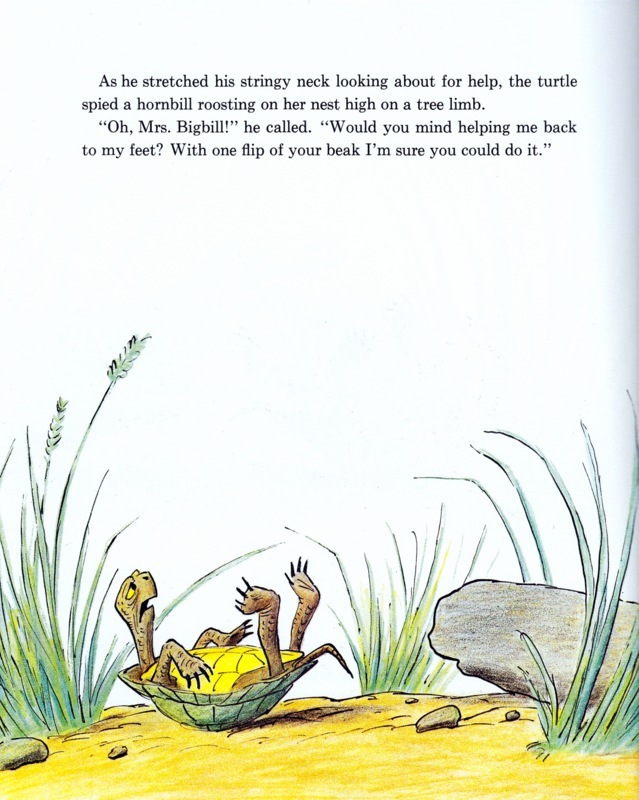 Soon enough the turtle finds himself in a bit of a bind, having tipped onto his back while trying to climb onto a rock. He asks a nearby hornbill for a hand and receives a response quite similar to the one he gave the ant. 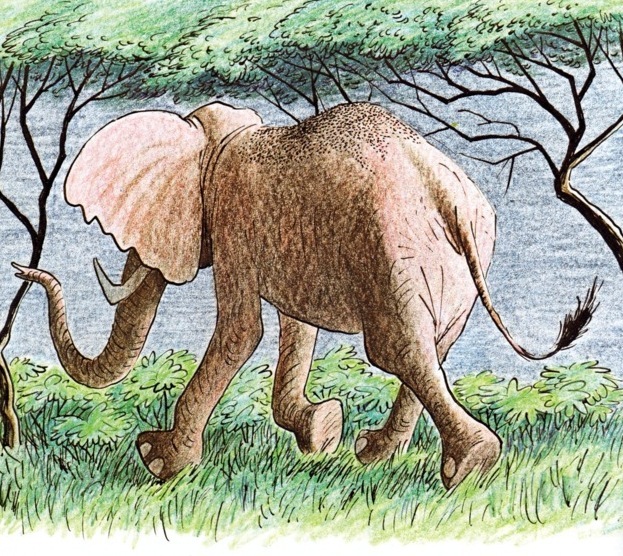 The accommodating elephant, having heard all the events of the day, makes his way to the river to assist the miniscule creature. He offers the trapped ant his trunk; the grateful ant crawls on and is deposited safely on the shore of the river. The elephant continues on, helping each of the helpless—and shockingly ungrateful—creatures along the way. 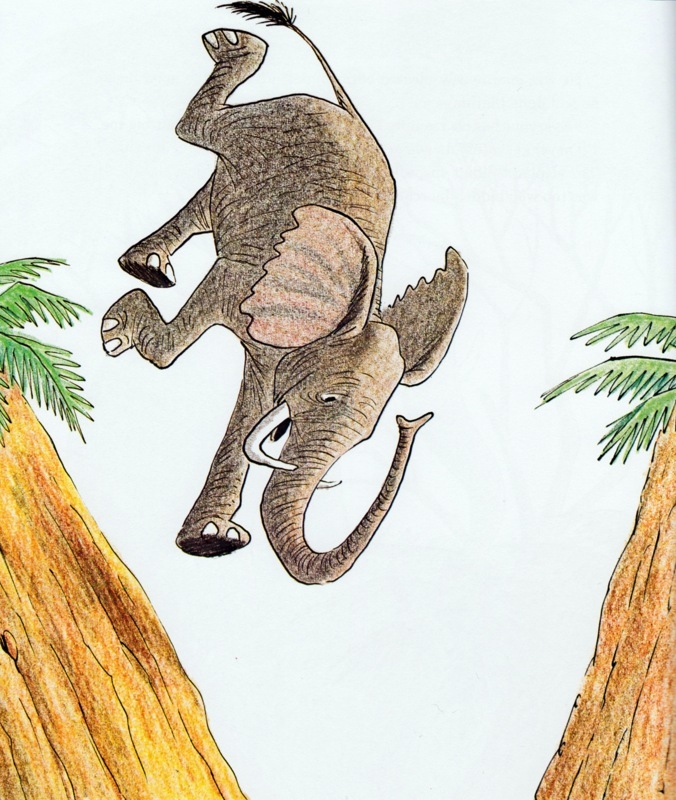 Soon it is the elephant that finds himself in a disabled position; he’s fallen into a ravine. He calls for help and waits and waits. As the sun sets, the elephant hears the sound of tiny footsteps. Soon, ninety-five thousand ants arrive to help him! They successfully lift the giant beast and carry him up the wall and onto flat ground. And in return all of the ants climb aboard their new, grateful friend for their first ever elephant ride! Who could truly resist such an offer? 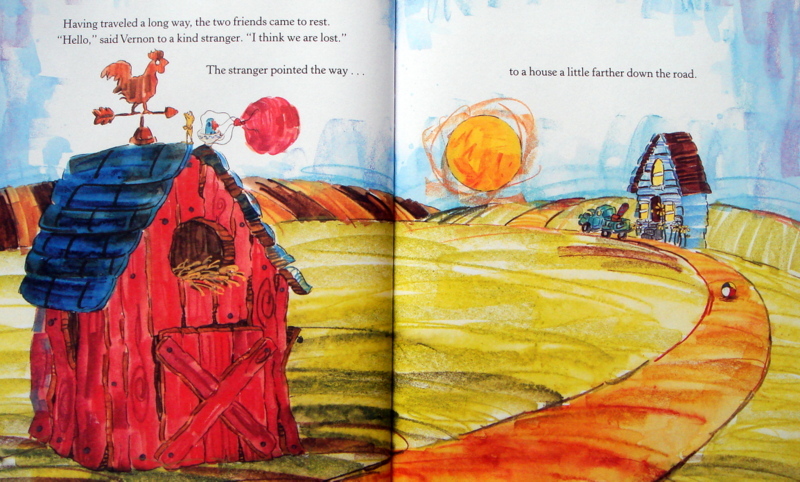 As with Portis’s other books (Not a Box and Not a Stick), she uses limited colors and produces beautifully austere, perfectly textured art. Edna is a small and inquisitive penguin. She’s surrounded by white—the ice and snow, black—the night, and blue—the sky and the water. When she goes searching for more color, she finds an orange tent. She brings some of her penguin friends to check it out and one of the human researchers inhabiting the tent gives Edna an orange glove. She dons it as a hat and wonders what other colors the world might have to offer. 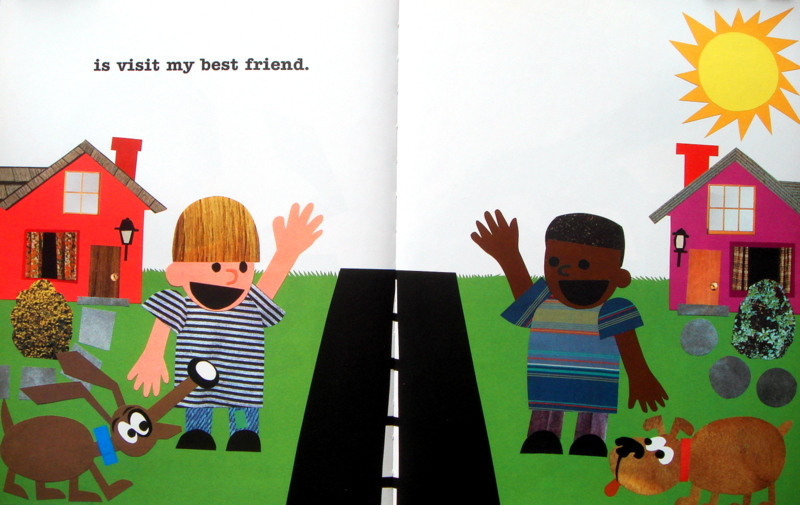 Yoon’s bold, cartoon-y illustrations and sparse text combine to produce an endearing story of friendship and patience. 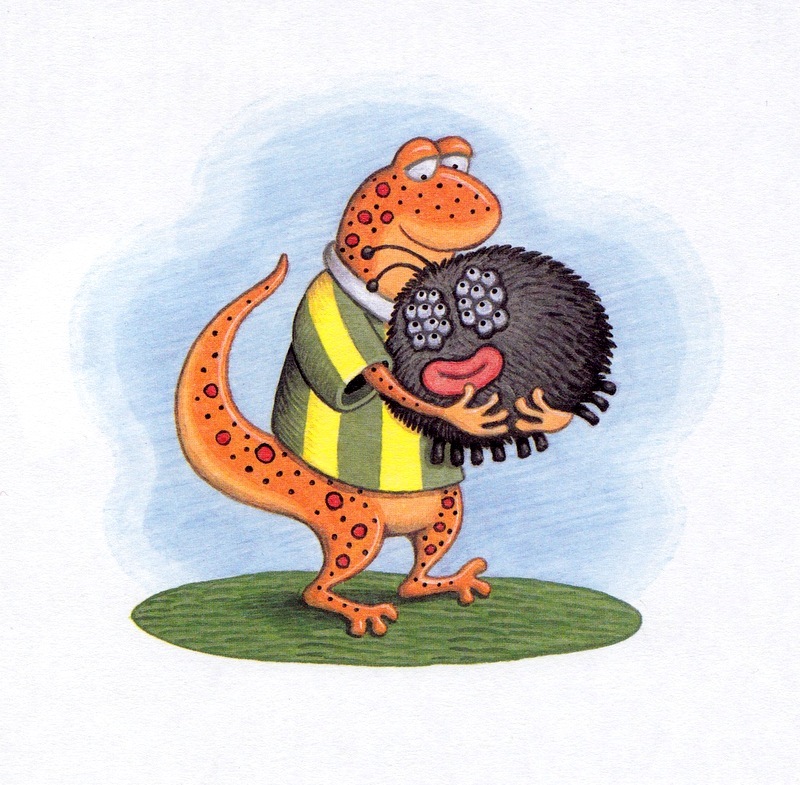 When Penguin found Pinecone he didn’t know what it was but it seemed like it was cold, so he knit a scarf for it. Grandpa explains to Penguin that pinecones live in forests, not in the snow. 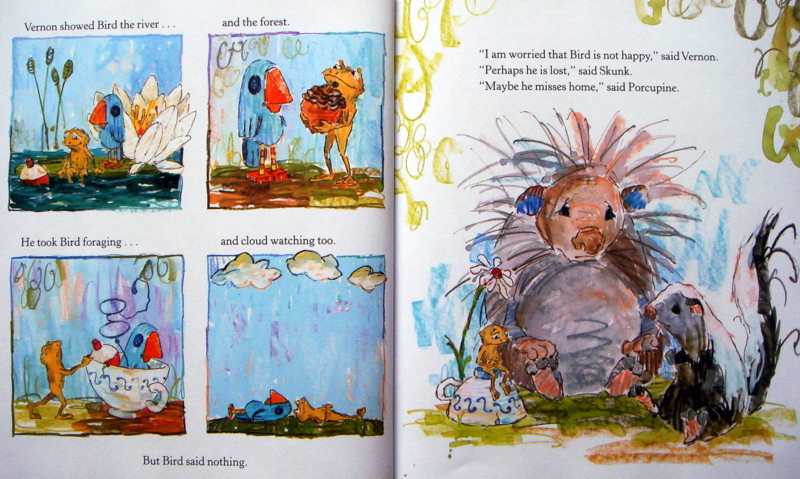 Penguin is sad but he must do what’s best for Pinecone, and he returns him to the forest. 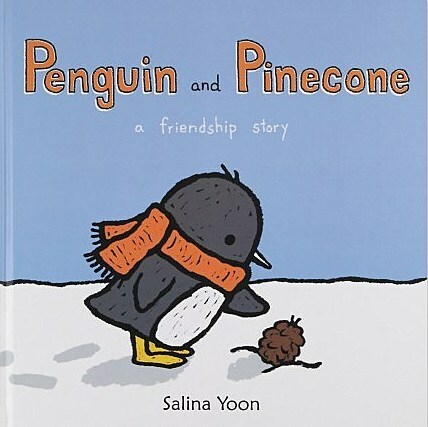 Later, when Penguin comes back to visit his friend, he discovers that Pinecone has grown, and so has Penguin’s love for Pinecone. Oliver Jeffers’s, This Moose Belongs to Me (2012) was a NYTimes Bestseller. His soft, calming art is crisp and expressive. 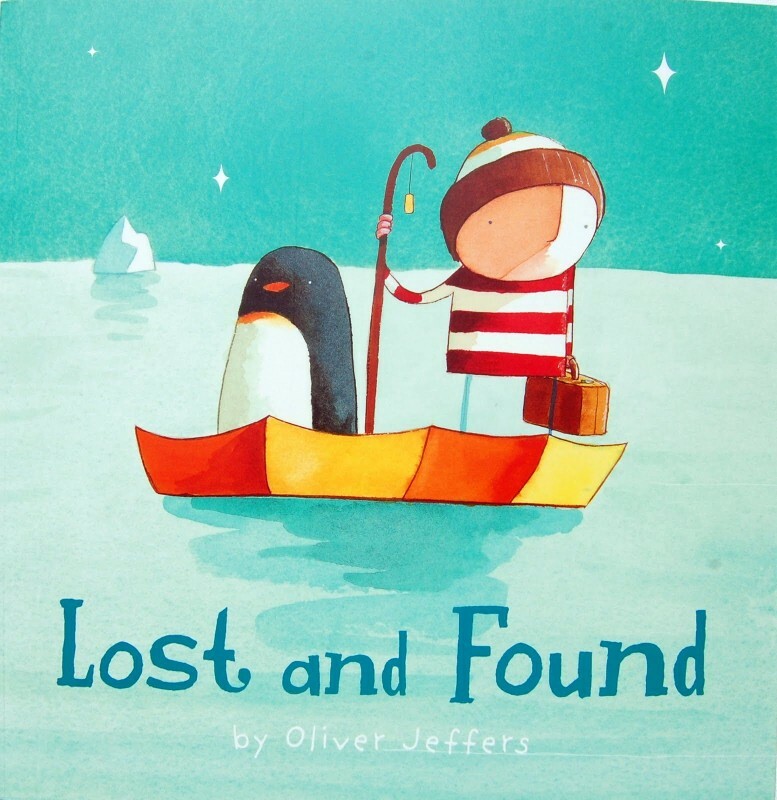 The boy, thinking the penguin is lost, sets out to find out where this quiet bird belongs. 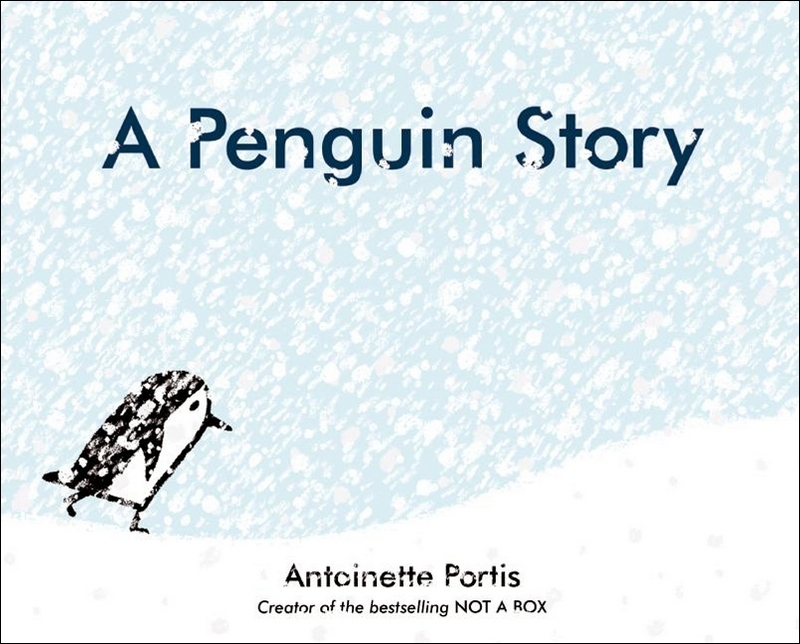 He learns that penguins live at the South Pole; the boy and the bird make the trip together. Once at their destination the boy learns his new friend wasn’t lost at all, just lonely, and the two friends decide to stick together. 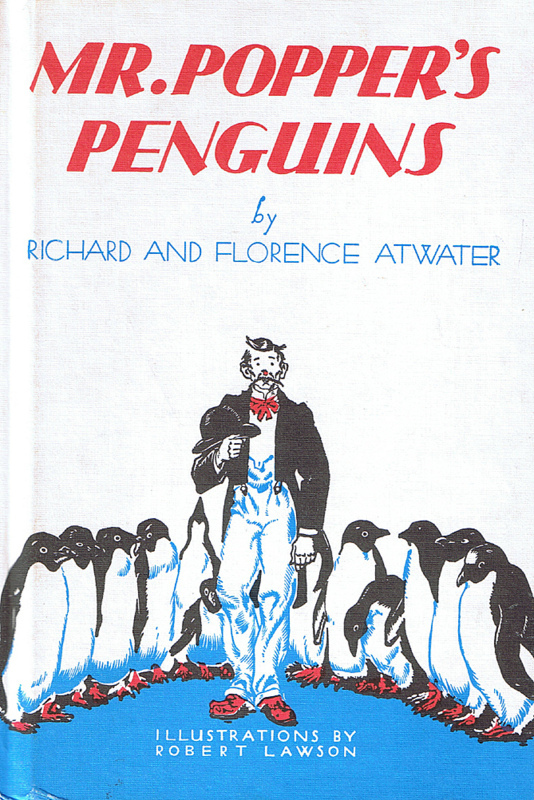 This pair has created some wonderful books together; Tacky the Penguin was one of my favorite books to sell. 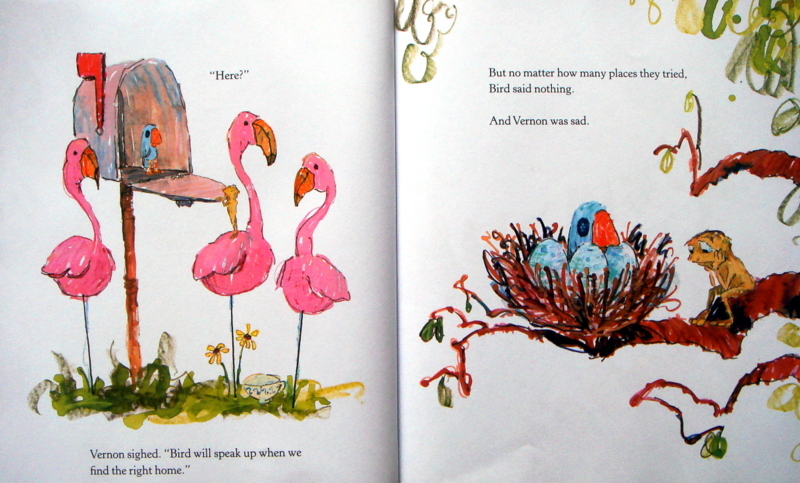 Lester’s stories are touching and funny and Munsinger’s art is whimsical and vibrant. 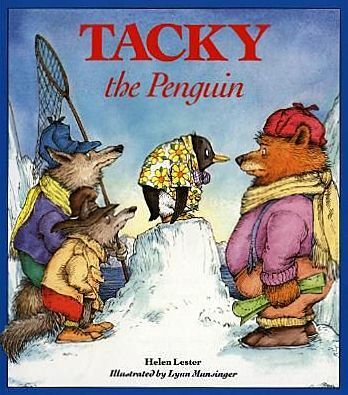 Tacky is not like the other penguins. They wear bowties, he wears a Hawaiian shirt; they are quiet and polite, Tacky is loud and graceless. But it’s Tacky’s odd behavior that scares off a pack of hunters and saves them all. Clear text and luscious collage art take us through a year in the life of Emperor penguins—their harsh environment, their family dynamic and their eating habits. After the mother lays the egg, the father must carefully roll the egg onto his feet and keep it warm. Once the egg hatches, both parents must work diligently to feed the chick and keep it safe and warm. The chick will make its first swim during the short summer, then the whole family must fatten up for the approaching winter. 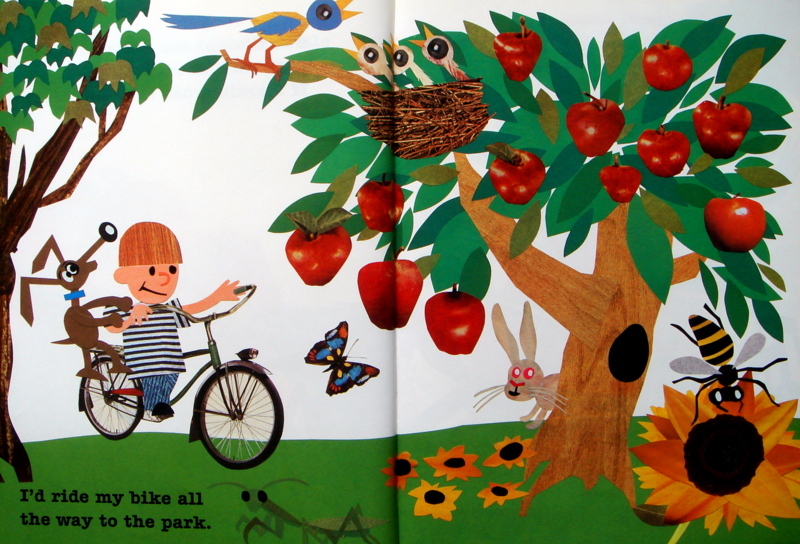 This informative non-fiction book is also a beautiful storybook. 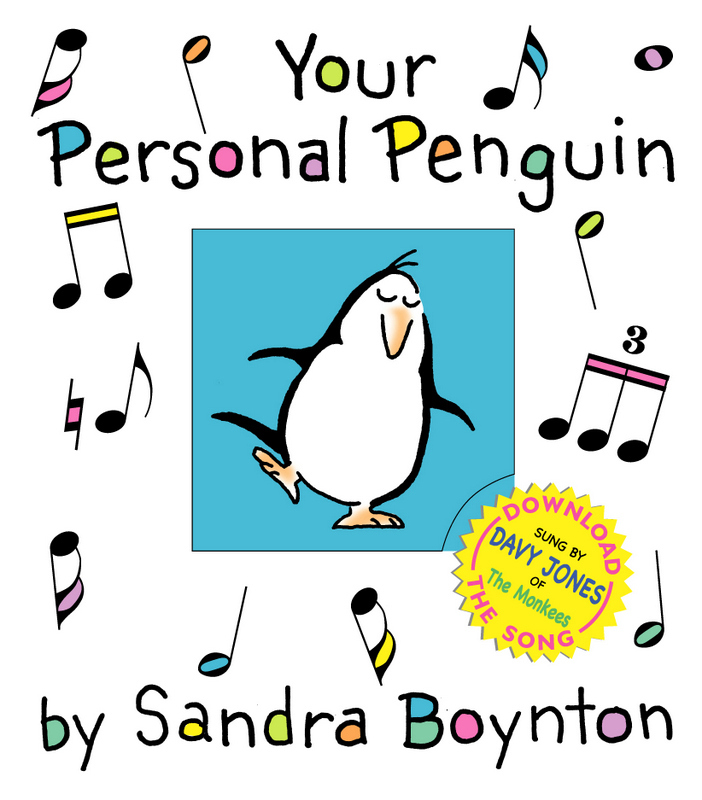 With playful, rhyming text and lush, detailed art, this husband and wife team takes readers on a journey through some of the fun activities a penguin experiences—diving, swimming, and sliding on the ice, to name a few. 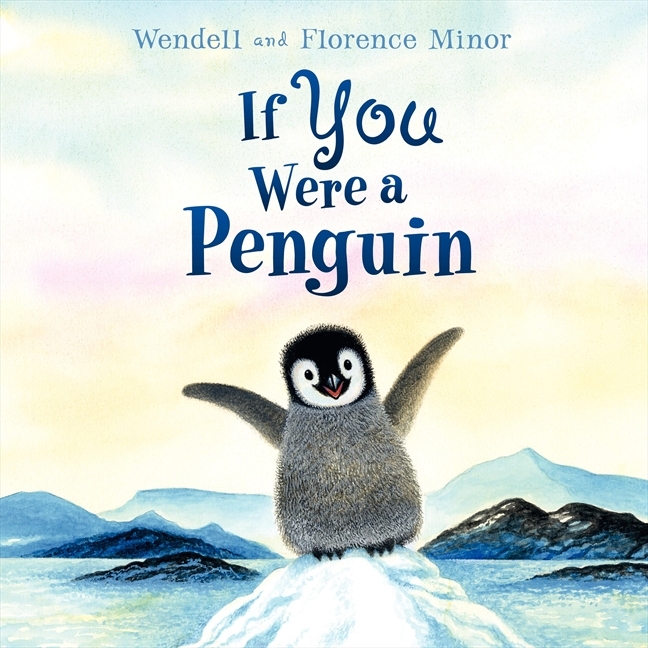 There’s also a visual key to the ten different species of penguins found in this book and resources for learning more about penguins. Small’s clean, loose line drawings and restricted palette bring Buzzeo’s spare and quirky text to life. 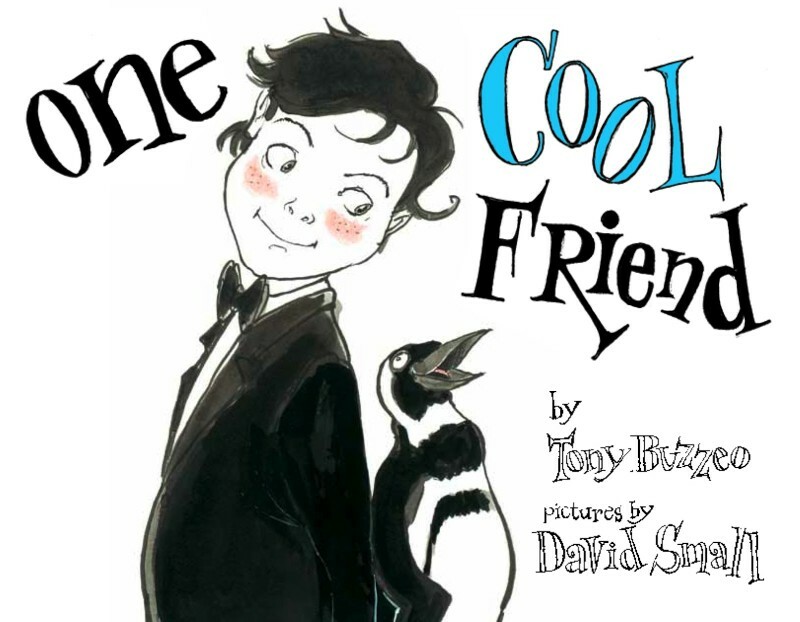 Young Eliot visits the zoo with his father and decides to bring one of the penguins home with him! His father—easily distracted and often otherwise engaged—doesn’t seem to notice the new resident at his house, or so readers are lead to believe. 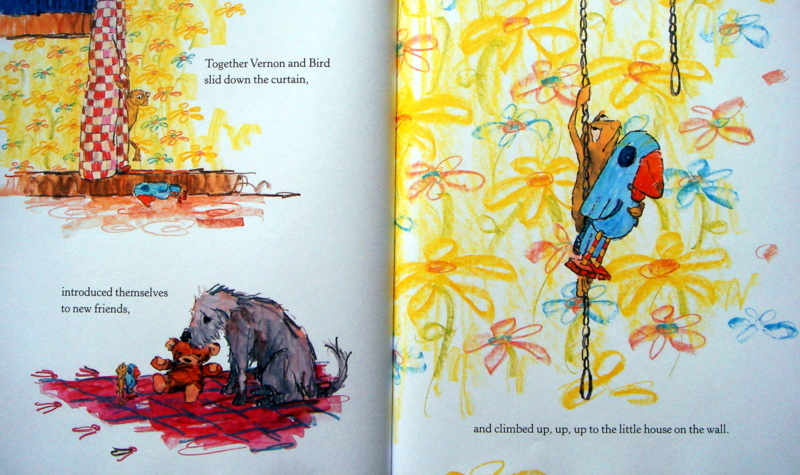 Stunningly beautiful, sumptuous paintings cover every page of this over-sized picture book. 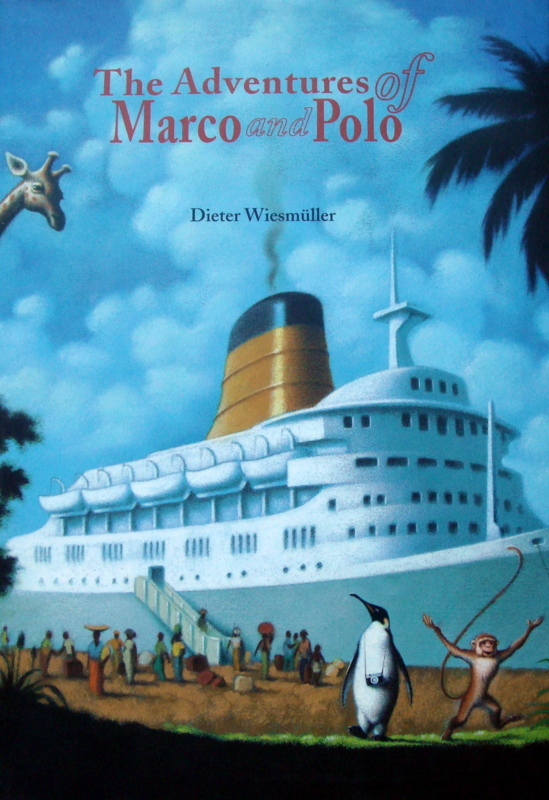 Polo Penguin and Marco Monkey meet when Marco’s cruise ship arrives in Antarctica. Marco is amazed at all the icy sites Polo introduces him to; he’s also amazed at how cold he is. When Marco says he must go home Polo decides to travel with him since he’s eager to learn all about Marco’s home. The lush, green world is very different from his icy blue environs, and so, so hot! The two friends would like to be together but realize they must each return to their own home; now they each have a pen pal. 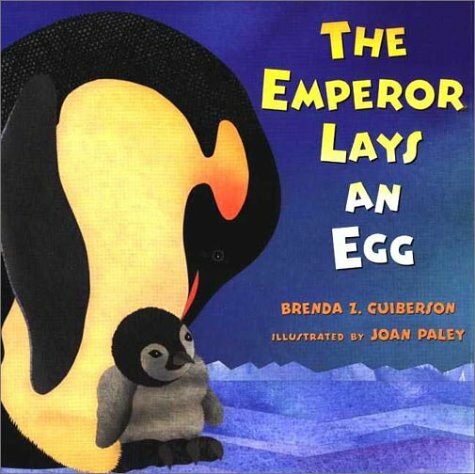 This beautiful book is based on a true story about an unorthodox family at the Central Park Zoo. Soft, realistic watercolors adorn this uplifting and sweet story. While all the other mated penguins are tending to their newly laid eggs, Roy and Silo—two male penguins—find a rock to care for together. The zookeeper notices their activities and trades the rock for a penguin egg in need of nurturing. 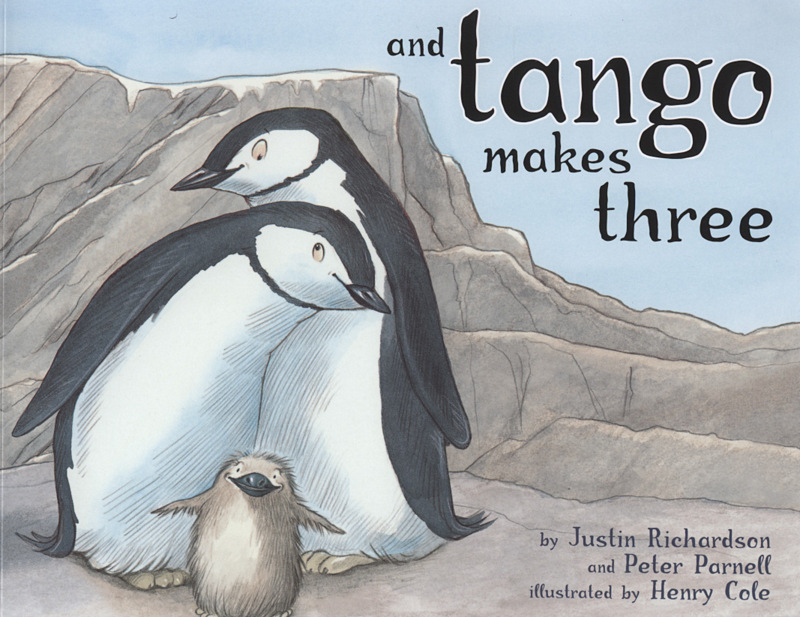 The two take turns caring for the fragile egg and before long their daughter Tango is born. This fantastically ridiculous story—and 1939 Newbury Honor book— was illustrated by the extremely talented Robert Lawson (The Story of Ferdinand). Mr. Popper wishes he’d seen more of the world before he married Mrs. Popper. He spends his spare time reading and daydreaming about Arctic explorers. Then one of those explorers sends him a penguin in response to a fan letter! When that penguin gets lonely, the Poppers acquire another lonely penguin to be his mate; eventually the pair produces ten more penguins. And that’s when Mr. Popper starts touring the “Popper’s Performing Penguins, First Time on Any Stage, Direct from the South Pole” show. This is not only an excellent read-aloud book for the whole family, but also an enjoyable (and quick) book for any reader who loves to laugh. Newt is a superb book full of wit and charm. Matt Novak has written several books for children, picture books and early readers. He’s also been a puppeteer, a teacher and a Disney artist—he worked on Rescuers Down Under and Beauty and the Beast—so he’s had a lot of experience with reaching children. Everything about Newt is utterly charming. The pleasingly warm art glows with life. The straightforward text is heartening and funny. 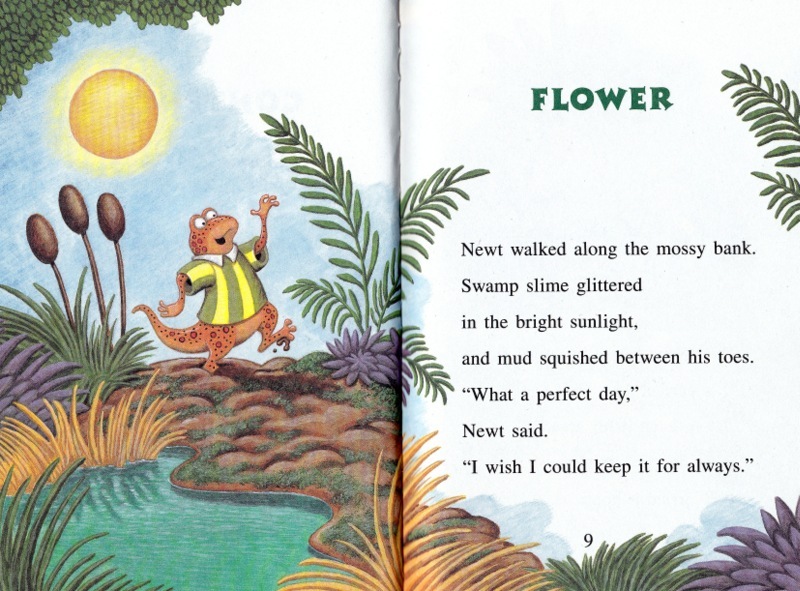 And Newt himself is an irresistible salamander in a sporty jersey and a jaunt in his step. What’s not to love? Newt is out walking and enjoying a beautiful day. When he encounters a “perfect” red flower he decides to dig it up and take it home and keep it for always. But once home he realizes he does not have a pot to plant it in. 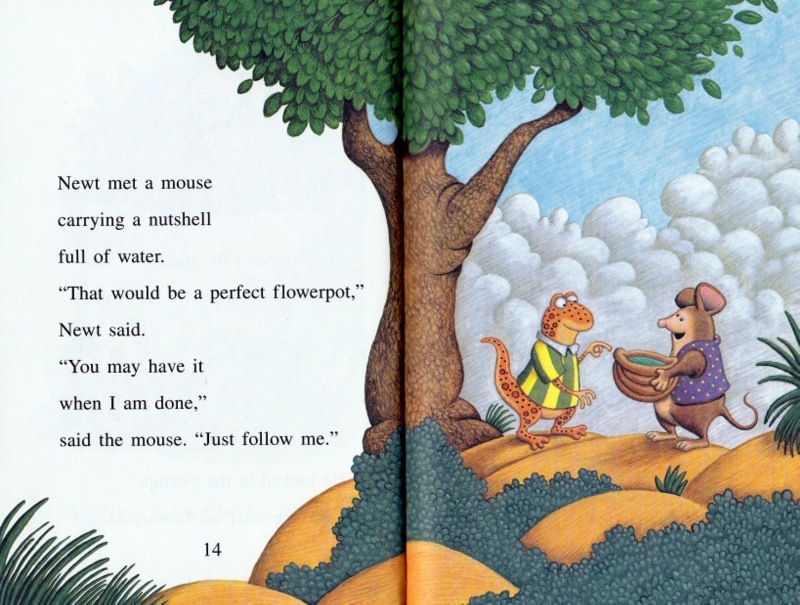 Newt goes in search of a pot and meets a plump mouse carrying a nutshell, a nutshell that looks like a perfect flowerpot. The mouse offers to give Newt the nutshell. First the mouse needs to water his flower, but where his flower should be there is just a hole in the ground! Newt does not say anything. He goes home and plants the flower, and it does not look so perfect anymore. 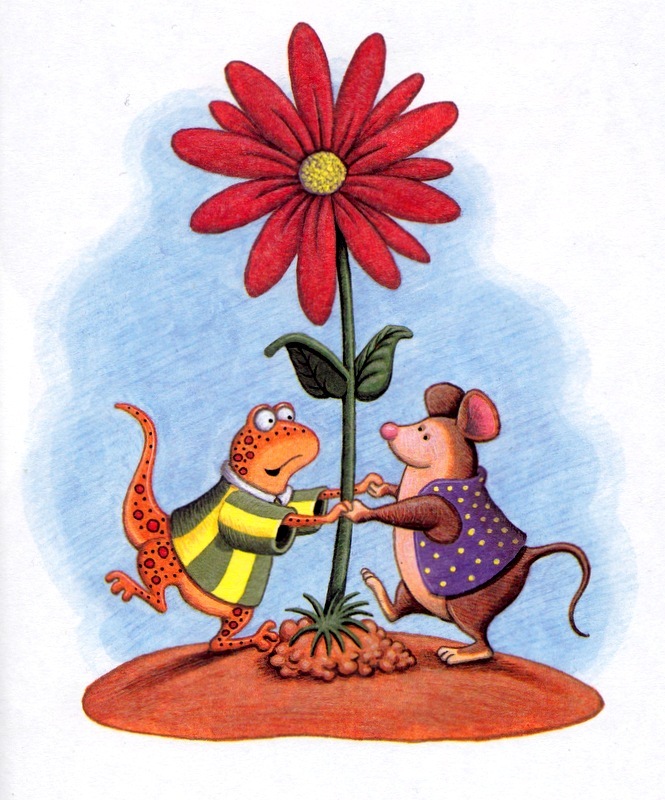 When Newt and the flower arrive back at the hole, the mouse was still there and they planted the flower together. It was a perfect day. The bug—a round, fuzzy creature with two sets of ten eyes and eight legs that run straight across its body—is pathetically adorable. 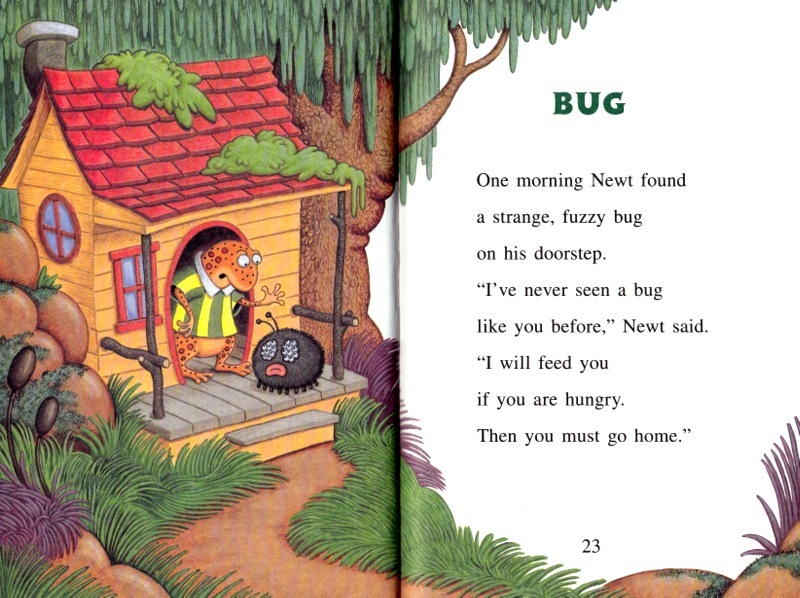 Newt offers him some food but insists the bug must go home after eating. The bug ate, but he did not go home. After meeting a bird (sporting a Hawaiian shirt) accompanied by a beautiful pet butterfly, Newt decides to try to spruce up his bug. 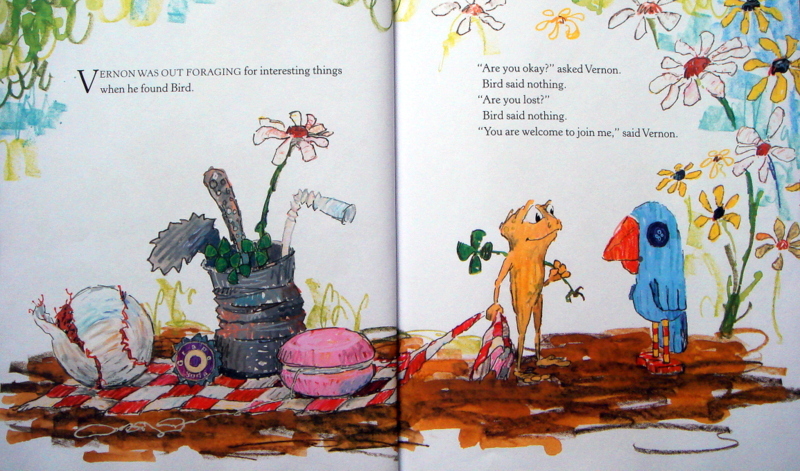 Next Newt meets a joyous rabbit with a pet cricket, and the cricket can play music! 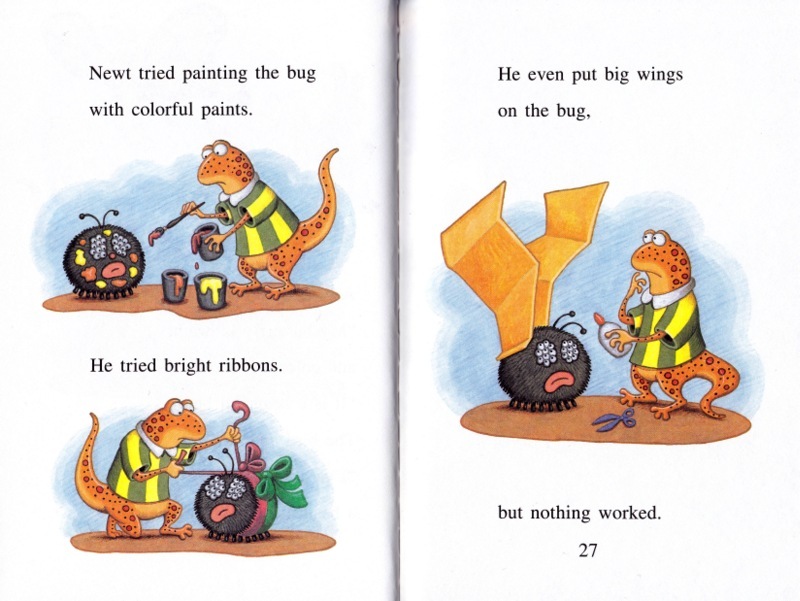 Newt sets out to see if his bug has any talents. 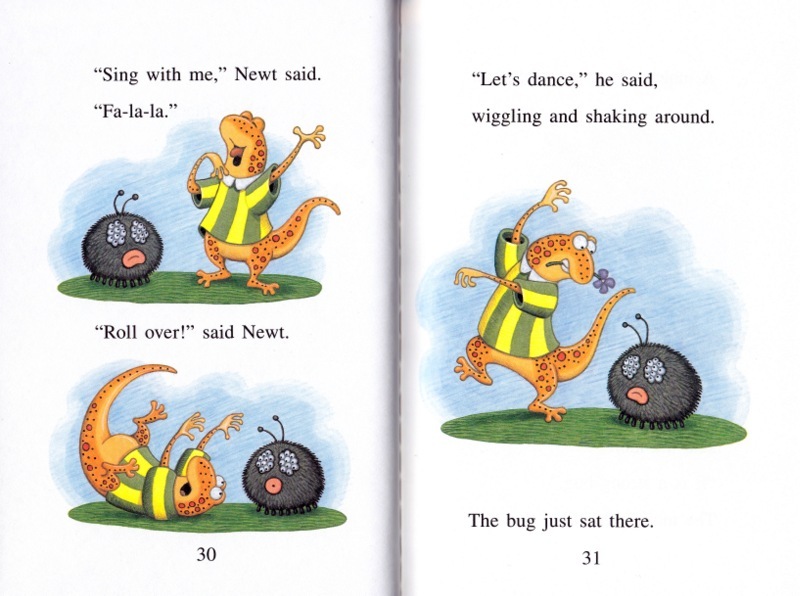 Next Newt meets a contended mole riding on a big ant, so he tries to ride the bug but the bug does not move. 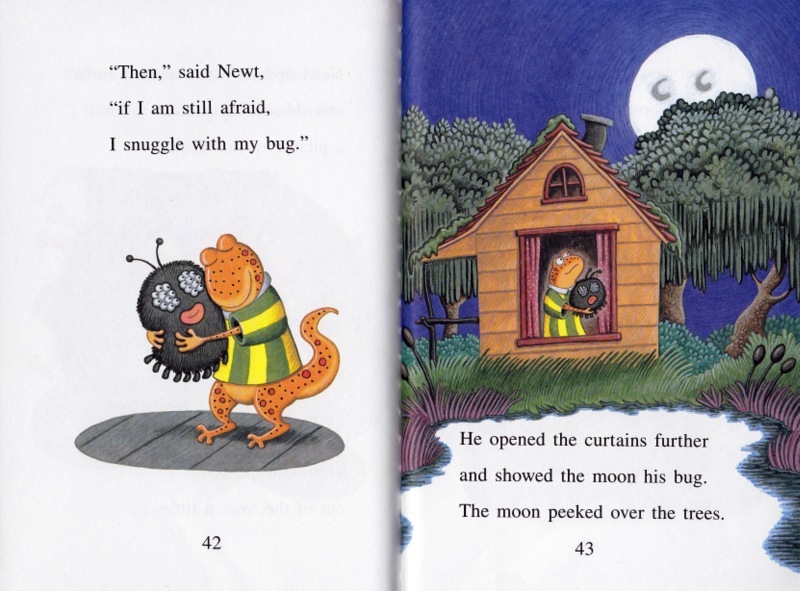 Then the soft bug jumped into Newt’s arms and made a nice buzzing sound and Newt held the bug. 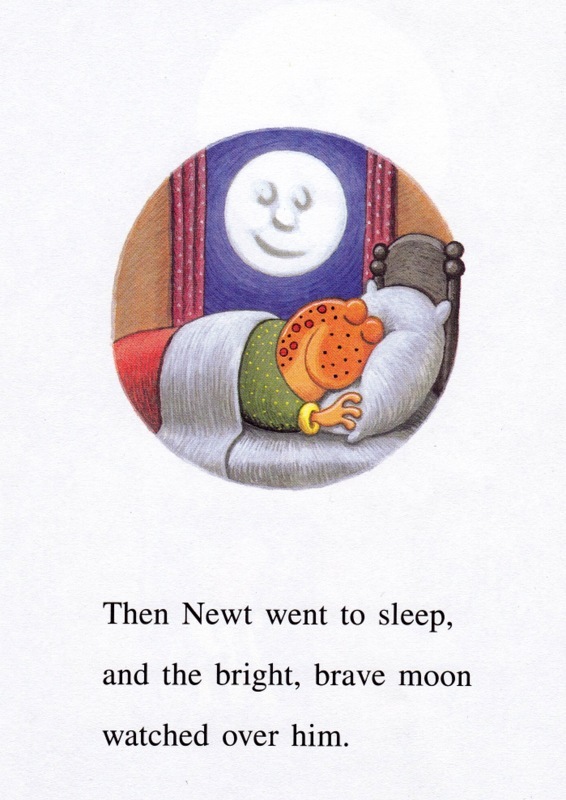 It was night, but Newt was awake. He peered at the moon through a gap in his curtains. Newt shares with the moon some of the things he does when he feels scared. 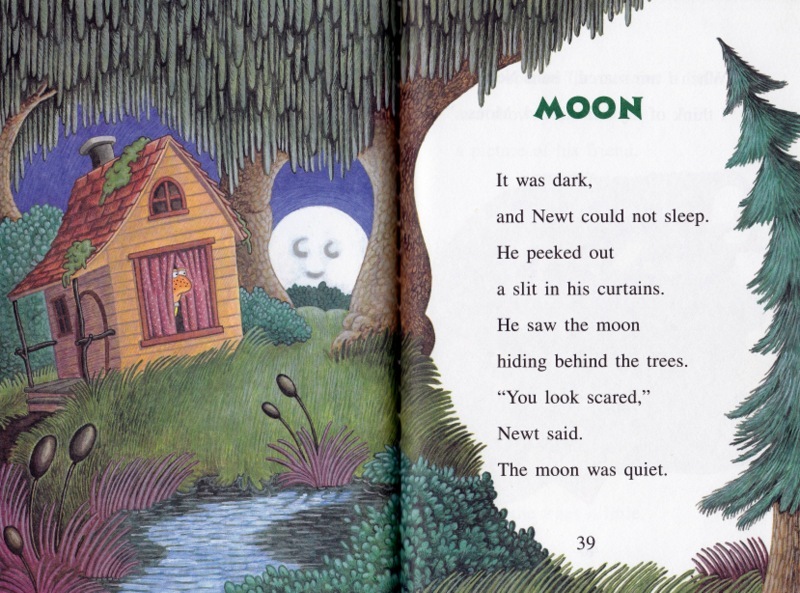 After describing each comforting activity Newt opens the curtains a bit more; the moon rises in the sky. He assures the moon that shadows in the room are not as scary as they seem and opens his curtains wide; the moon is high above the house. Newt is superb book full of wit and charm, and one worth sharing with the whole family. If I Crossed the Road, full of fun and adventure! Stephen Kroninger is a multi-media artist. As a commercial artist his work has appeared in Time Magazine, Newsweek, The New Yorker and The New York Times. As an animator he’s produced work for Nickelodeon and HBO. 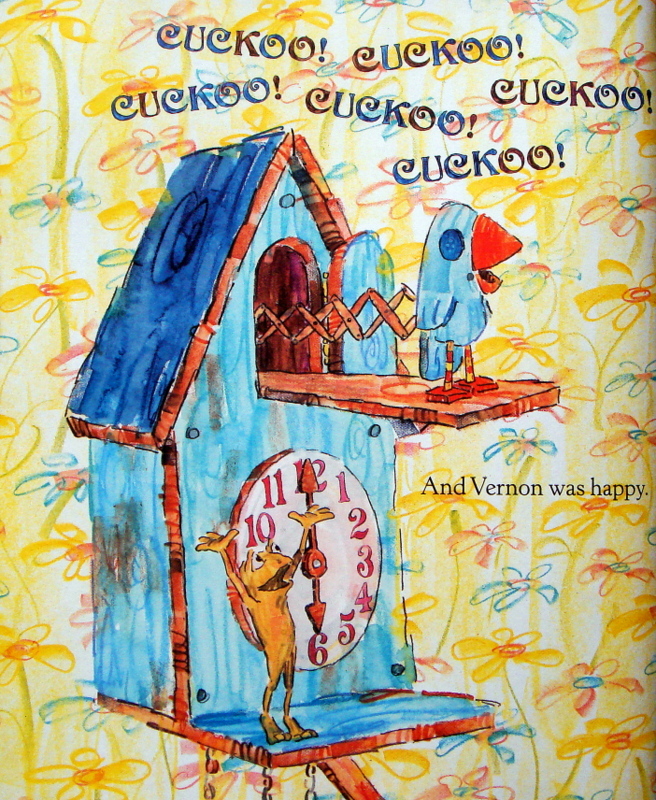 In addition to If I Crossed the Road, he’s published two other picture books for children. He works with cut paper, magazine clippings and photographs to create his vibrant, uncluttered collage art. It’s bold, colorful, whimsical and so much fun. 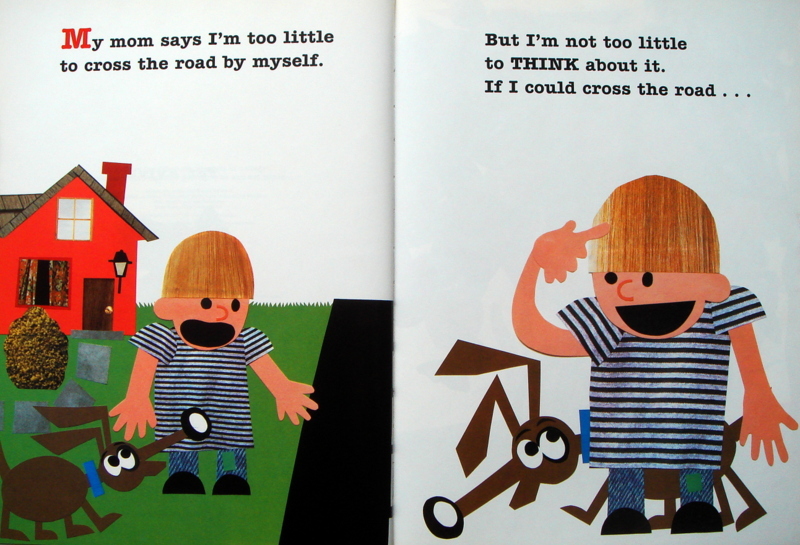 If I Crossed the Road is an utterly uncomplicated story about young boy and all the things he would do, if only he was allowed to cross the road. Though the thing he’d most like to do is quite simple, his wild imagination brings him to the farthest reaches of the universe. If he could cross the road, he’d ride his bike to the park and play ball. Maybe he’d visit his grandpa, or go fishing. 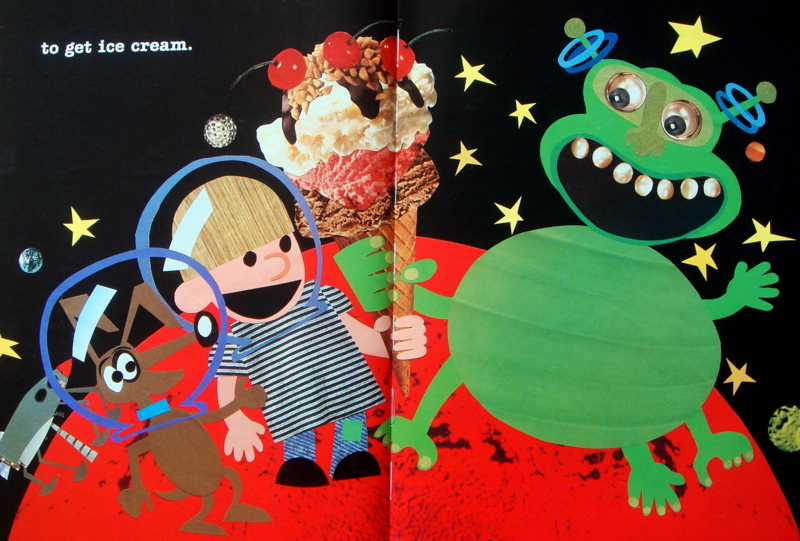 Perhaps he’d even get ice cream…in outer space! And no matter where he goes, his dog is always by his side. But what’s the thing he’d most like to do, if only he could cross the road? 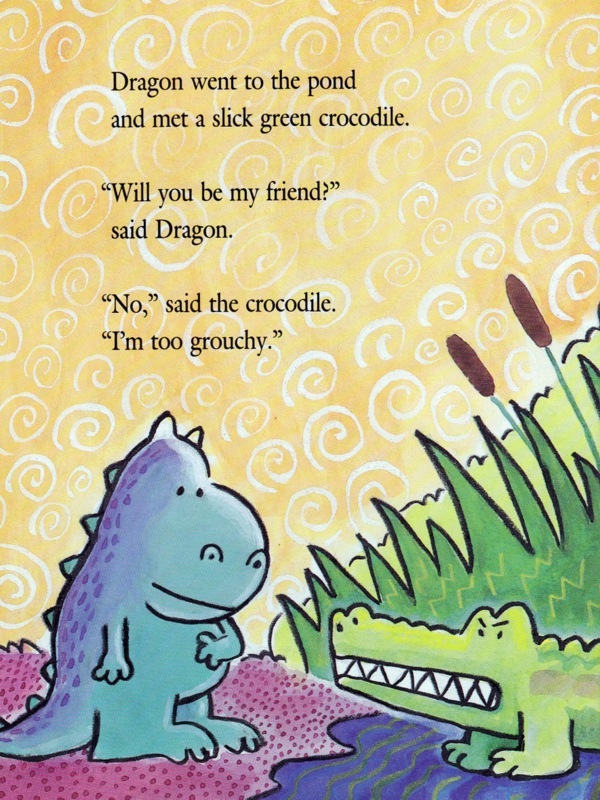 A Friend for Dragon: A charming, funny, and sometimes sad story of friendship. Dav Pilkey is the author and illustrator of the wildly popular Captain Underpants series. He’s created a number of wonderful books, many of which I truly love; I will forever be his fan for creating the five books in the Dragon series. 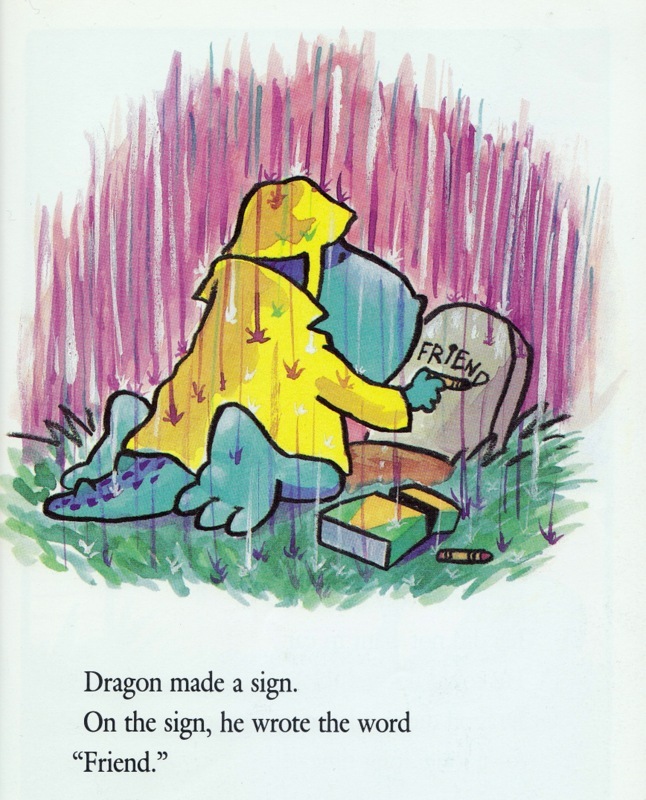 A Friend for Dragon was the first to be published. The other four titles are Dragon’s Fat Cat, Dragon Gets By, Dragon’s Halloween, and Dragon’s Merry Christmas. They are all wonderful. Dragon is sweet, kind and irresistibly adorable. Pilkey’s art is bright and happy; crammed with color and outlined with thick black crayon, it is immensely appealing. He occasionally uses patterns in the background creating texture and evoking thoughts of Van Gogh’s The Starry Night. A Friend for Dragon is a charming, funny and sometimes sad story of friendship. Told in five chapters, this book could be broken up over a few nights or read through in one sitting. Dragon is having trouble finding a friend; Crocodile is too grouchy, Hippo is too tired and Squirrel is too busy. Dragon sits down under a tree. 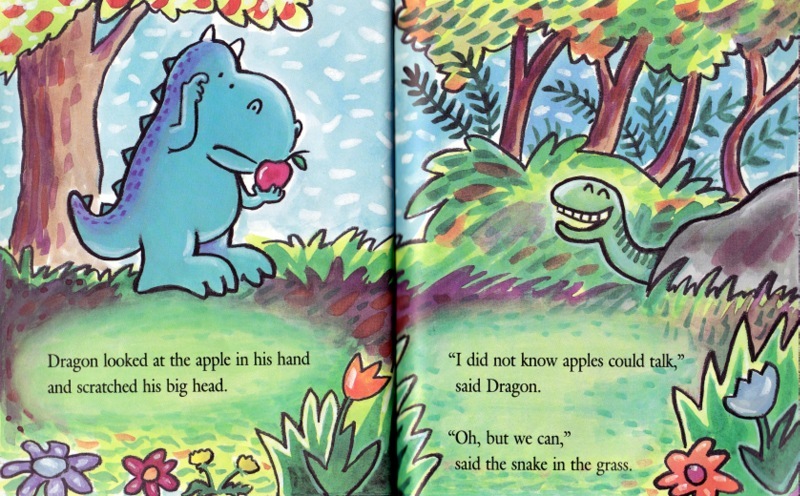 When an apple falls on his head he’s tricked by a passing snake into thinking he’s found his friend. Dragon, happy to have a new friend, brings the apple home. They have a great time together! 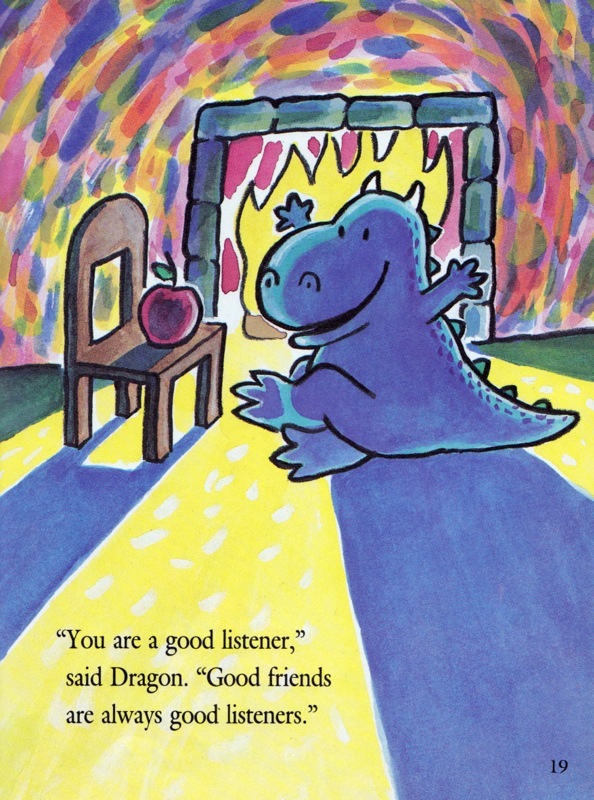 Dragon builds a fire and tells the apple scary stories; the apple is a very good listener. 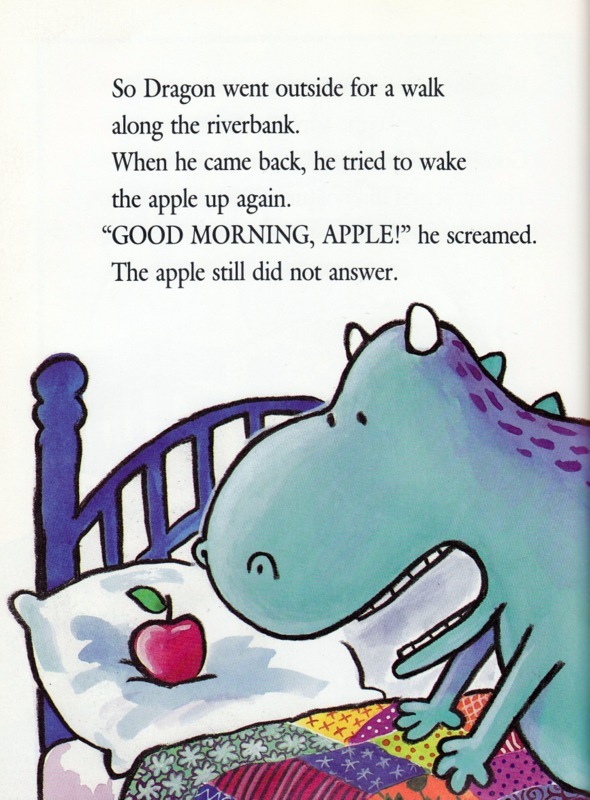 But the next morning when Dragon tries to wake the apple for breakfast, the apple doesn’t respond. Dragon takes him to the doctor. While in the waiting room, Dragon asks a hungry-looking walrus to watch over his friend while he gets a drink of water. Dragon returns to a vastly different apple; no longer red and shiny, it is now white and wet and skinny. And he still will not respond to Dragon! Dragon rushes the apple home. The core of his former friend soon turns brown and mushy and Dragon must bury his beloved friend. 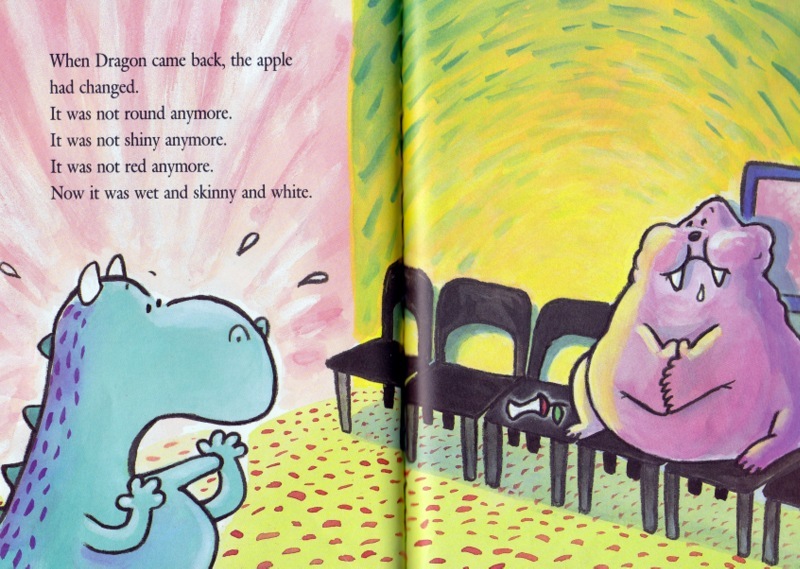 Dragon is very sad and really misses the apple. Many months have passed and Dragon still misses his friend. He is less sad now but still lonely. Dragon sits down under a tree in his backyard and wishes for a friend. 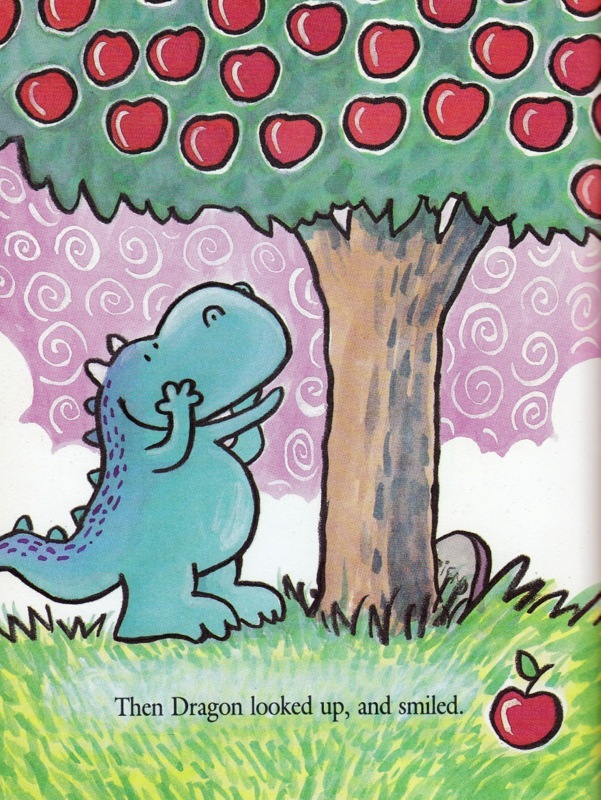 Once again, Dragon is hit in the head by a falling apple. A Friend for Dragon is a beautiful and amusing story of friendship, loss and new beginnings.